The brains of humans are conspicuously larger than the brains of other apes, but the human-specific genetic factors responsible for the uniquely large human neocortex remain obscure. Since humans split from chimps, which have brains roughly a third of human size, the human genome has undergone roughly 15 million changes. Which of these genetic tweaks could have led to big brains? A partial answer that question may have been found by scientists based at Howard Hughes Medical Institute (HHMI). These scientists, led by David Haussler, Ph.D., an HHMI investigator and a bioinformatician at the University of California, Santa Cruz (USCC), decided to take a new look at a set of human-specific brain development genes that they had investigated—and dismissed—earlier. These genes, the scientists realized, may have been dismissed too hastily. 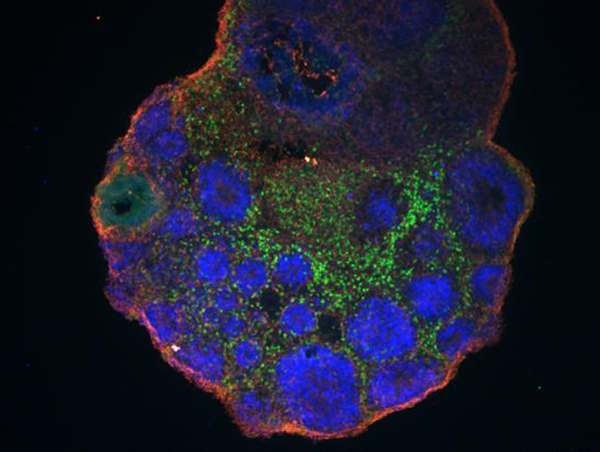 About six years ago, scientists in the Haussler lab discovered a gene called NOTCH2NL. It's a relative of NOTCH2, a gene that scientists knew was central to early brain development. NOTCH2 controls vital decisions regarding when and how many neurons to make. When the Haussler team looked in the official version of the human genome at that time—version 37—NOTCH2NL appeared to be located in chromosome 1 near a region linked to abnormal brain size. Delete a hunk of the region, and brains tend to shrink. Duplicate part of it, and brains tend to overgrow. “We thought, 'Oh, this is incredible,'” Haussler said. NOTCH2NL seemed to check all the boxes for a key role in human brain development. But when the team mapped NOTCH2NL's precise location in the genome, they discovered the gene wasn't actually in the relevant chromosomal region after all; the once-promising candidate seemed to be a dud. Genetic analysis of several primate species revealed that the three genes exist only in humans and their recent relatives, the Neanderthals and Denisovans, not in chimpanzees, gorillas, or orangutans. What's more, the timing of these genes' emergence matches up with the period in the fossil record when our ancestors' craniums began to enlarge, Haussler points out. Together, the results suggest that NOTCH2NL genes played a role in beefing up human brain size. “I thought, oh my God, now it all really fits together,” he said. Details of the reappraisal of NOTCH2NL appeared May 31 in the journal Cell, in an article entitled “Human-Specific NOTCH2NL Genes Affect Notch Signaling and Cortical Neurogenesis.” According to this article, that three paralogs of human-specific NOTCH2NL are highly expressed in radial glia. Also, different alleles of NOTCH2NL have varying potencies to enhance Notch signaling by interacting directly with NOTCH receptors. UCSC cell biologist Sofie Salama, Ph.D., led efforts to figure out how these genes might work—and how they might contribute to disease. Experiments with lab-grown patches of brain tissue from mouse and human embryonic stem cells hinted that NOTCH2NL genes tell developing brains to make more neuron progenitors. These are like little neuron factories, Haussler says. More progenitors mean more neurons—and ultimately bigger brains. The NOTCH2NL genes likely convey this brain-growing message via the well-studied Notch signaling pathway, Salama and her colleagues discovered. Scientists already knew that cells rely on this pathway for proper neuronal function. Having three active NOTCH2NL genes cranks up the messaging, “adding an extra push to the pathway,” Salama explained. Precise mapping was difficult, Salama says, because that area of the genome is so repetitive—assembling the correct sequence of DNA is like trying to put together a puzzle with nearly identical pieces. But the team developed a sequencing technology to solve the problem, and they pinpointed how the NOTCH2NL genes were improperly pieced together in the patients with autism. The results suggest a direct link between the disorder and reshuffled NOTCH2NL genes, Salama noted.